A large, global manufacturing firm had successfully implemented Lean approximately 10 years ago and had shown excellent success in reducing costs and enhancing productivity. Unfortunately, the firm was experiencing ever increasing customer complaints about poor product quality. Employee skill sets were not able to effectively address the quality issues. eMRI was asked by a senior corporate executive to work with the organization’s continuous improvement team to design and implement an initiative to complement existing Lean efforts and focus on enhancing process capabilities and reducing rework, scrap and customer complaints. Because of the data-intensive nature of the business, a Lean Six Sigma approach was selected. A key factor was determining how to best implement and sustain Lean Six Sigma efforts while not negatively taking away from or impacting the results of the ongoing Lean efforts. 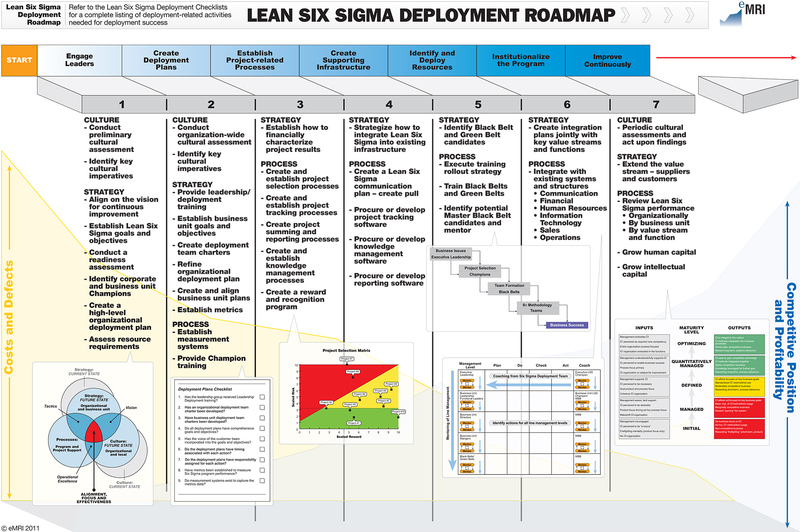 Working with a modified plan based on eMRI’s book “Successfully Implementing Lean Six Sigma: The Lean Six Sigma Deployment Roadmap”, a plan to layer Lean Six Sigma onto the existing Lean efforts was developed. Three years later, Lean Six Sigma efforts are taking place in harmony with Lean efforts. Many customer issues have been resolved, the number of customer issues has declined, and process capabilities of key processes have been measurably improved.